For the 2005 disaster television film, see Supervolcano (film). A supervolcano is a large volcano that has had an eruption of magnitude 8, which is the largest value on the Volcanic Explosivity Index (VEI). This means the volume of deposits for that eruption is greater than 1,000 cubic kilometers (240 cubic miles). Supervolcanoes occur when magma in the mantle rises into the crust but is unable to break through it and pressure builds in a large and growing magma pool until the crust is unable to contain the pressure. This can occur at hotspots (for example, Yellowstone Caldera) or at subduction zones (for example, Toba). Another setting for the eruption of very large amounts of volcanic material is in large igneous provinces, which can cover huge areas with lava and volcanic ash, causing long-lasting climate change (such as the triggering of a small ice age), which can threaten species with extinction. The Oruanui eruption of New Zealand's Taupo Volcano (about 26,500 years ago) was the world's most recent super eruption at a VEI-8 eruption. The origin of the term "supervolcano" is linked to an early 20th-century scientific debate about the geological history and features of the Three Sisters volcanic region of Oregon in the United States. In 1925, Edwin T. Hodge suggested that a very large volcano, which he named Mount Multnomah, had existed in that region. He believed that several peaks in the Three Sisters area are the remnants of Mount Multnomah after it had been largely destroyed by violent volcanic explosions, similar to Mount Mazama. In 1948, the possible existence of Mount Multnomah was ignored by volcanologist Howel Williams in his book The Ancient Volcanoes of Oregon. The book was reviewed in 1949 by another volcanologist, F. M. Byers Jr. In the review, Byers refers to Mount Multnomah as a supervolcano. Subsequent research proved that each peak of the Three Sisters was formed independently, and that Mount Multnomah did not exist. More than fifty years after Williams' book was published, the term supervolcano was popularised by the BBC popular science television program Horizon in 2000, to refer to eruptions that produce extremely large amounts of ejecta. The term megacaldera is sometimes used for caldera supervolcanoes, such as the Blake River Megacaldera Complex in the Abitibi greenstone belt of Ontario and Quebec, Canada. Eruptions that rate VEI 8 are termed "super eruptions". Though there is no well-defined minimum explosive size for a "supervolcano", there are at least two types of volcanic eruptions that have been identified as supervolcanoes: large igneous provinces and massive eruptions. Large igneous provinces, such as Iceland, the Siberian Traps, Deccan Traps, and the Ontong Java Plateau, are extensive regions of basalts on a continental scale resulting from flood basalt eruptions. When created, these regions often occupy several thousand square kilometres and have volumes on the order of millions of cubic kilometers. In most cases, the lavas are normally laid down over several million years. They release large amounts of gases. The Réunion hotspot produced the Deccan Traps about 66 million years ago, coincident with the Cretaceous–Paleogene extinction event. The scientific consensus is that a meteor impact was the cause of the extinction event, but the volcanic activity may have caused environmental stresses on extant species up to the Cretaceous–Paleogene boundary. Additionally, the largest flood basalt event (the Siberian Traps) occurred around 250 million years ago and was coincident with the largest mass extinction in history, the Permian–Triassic extinction event, although it is unknown whether it was solely responsible for the extinction event. Such outpourings are not explosive, though lava fountains may occur. Many volcanologists consider that Iceland may be a large igneous province that is currently being formed. The last major outpouring occurred in 1783–84 from the Laki fissure which is approximately 40 km (25 mi) long. An estimated 14 km3 (3.4 cu mi) of basaltic lava was poured out during the eruption. 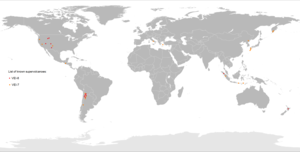 The Ontong Java Plateau has an area of about 2,000,000 km2 (770,000 sq mi), and the province was at least 50% larger before the Manihiki and Hikurangi Plateaus broke away. Location of Yellowstone hotspot over time (numbers indicate millions of years before the present). Volcanic eruptions are classified using the Volcanic Explosivity Index, or VEI. It is a logarithmic scale, which means that an increase of one in VEI number is equivalent to a tenfold increase in volume of erupted material. VEI 7 or VEI 8 eruptions are so powerful that they often form circular calderas rather than cones because the downward withdrawal of magma causes the overlying rock mass to collapse into the empty magma chamber beneath it. 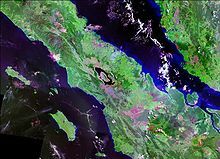 Satellite image of Lake Toba, the site of a VEI 8 eruption c. 75,000 years ago. Cross-section through Long Valley Caldera. Based on incomplete statistics, at least 60 VEI 8 eruptions have been identified. VEI 7 eruptions, less colossal but still massive, have occurred in historical times. Four VEI 7 eruptions have occurred within the past 2000 years: Taupo Volcano's Hatepe eruption c. 232, the 946 eruption of Paektu Mountain, the eruption of Mount Samalas in 1257, and the 1815 eruption of Mount Tambora. VEI 7 eruptions have happened in the following locations. * means DRE (dense rock equivalent). Nova featured an episode "Mystery of the Megavolcano" in September 2006 examining such eruptions in the last 100,000 years. Satellite image of San Salvador, El Salvador and the Lake Ilopango caldera (also known as the Dark Age volcano) in the Valley of the Hammocks, site of a VEI 6–8 eruption and said to be ground zero for the extreme weather events of 535–536, when a dark veil settled on the world. ^ "Questions About Supervolcanoes". Volcanic Hazards Program. USGS Yellowstone Volcano Observatory. 21 August 2015. Archived from the original on 3 July 2017. Retrieved 22 August 2017. ^ Wilson, C. J. N. (2001). "The 26.5ka Oruanui eruption, New Zealand: An introduction and overview". Journal of Volcanology and Geothermal Research. 112 (1–4): 133–174. Bibcode:2001JVGR..112..133W. doi:10.1016/S0377-0273(01)00239-6. ^ Harris, Stephen (1988) Fire Mountains of the West: The Cascade and Mono Lake Volcanoes, Missoula, Mountain Press. ^ Byers, Jr., F. M. (1949) Reviews: The Ancient Volcanoes of Oregon by Howel Williams Archived 8 March 2016 at the Wayback Machine, The Journal of Geology, volume 57, number 3, May 1949, page 324. Retrieved 2012-08-17. ^ supervolcano, n. Oxford English Dictionary, third edition, online version June 2012. Retrieved on 2012-08-17. ^ Supervolcanoes Archived 1 August 2003 at the Wayback Machine. Bbc.co.uk (2000-02-03). Retrieved on 2011-11-18. ^ USGS Cascades Volcano Observatory Archived 13 February 2012 at WebCite. Vulcan.wr.usgs.gov. Retrieved on 2011-11-18. ^ de Silva, Shanaka (2008). "Arc magmatism, calderas, and supervolcanos". Geology. 36 (8): 671–672. Bibcode:2008Geo....36..671D. doi:10.1130/focus082008.1. Archived from the original on 21 May 2016. ^ a b Bryan, S.E. (2010). "The largest volcanic eruptions on Earth". Earth-Science Reviews. 102 (3–4): 207–229. Bibcode:2010ESRv..102..207B. doi:10.1016/j.earscirev.2010.07.001. ^ Keller, G (2014). "Deccan volcanism, the Chicxulub impact, and the end-Cretaceous mass extinction: Coincidence? Cause and effect?". Geological Society of America Special Papers. 505: 57–89. doi:10.1130/2014.2505(03). ^ Petraglia, M.; Korisettar, R.; Boivin, N.; Clarkson, C.; Ditchfield, P.; Jones, S.; Koshy, J.; Lahr, M. M.; et al. (2007). "Middle Paleolithic Assemblages from the Indian Subcontinent Before and After the Toba Super-Eruption". Science. 317 (5834): 114–6. Bibcode:2007Sci...317..114P. doi:10.1126/science.1141564. PMID 17615356. ^ Williams, M.A.J. & Royce, K. (1982). "Quaternary geology of the middle son valley, North Central India: Implications for prehistoric archaeology". Palaeogeography, Palaeoclimatology, Palaeoecology. 38 (3–4): 139. Bibcode:1982PPP....38..139W. doi:10.1016/0031-0182(82)90001-3. ^ a b c Global Volcanism Program | Volcanoes of the World | Large Holocene Eruptions Archived 13 February 2010 at the Wayback Machine. Volcano.si.edu. Retrieved on 2011-11-18. ^ Lindsay, J. M.; de Silva, S.; Trumbull, R.; Emmermann, R.; Wemmer, K. (2001). "La Pacana caldera, N. Chile: a re-evaluation of the stratigraphy and volcanology of one of the world's largest resurgent calderas". Journal of Volcanology and Geothermal Research. 106 (1–2): 145–173. Bibcode:2001JVGR..106..145L. doi:10.1016/S0377-0273(00)00270-5. ^ a b c Lisa A. Morgan & William C. McIntosh (2005). "Timing and development of the Heise volcanic field, Snake River Plain, Idaho, western USA". GSA Bulletin. 117 (3–4): 288–306. Bibcode:2005GSAB..117..288M. doi:10.1130/B25519.1. ^ Salisbury, M. J.; Jicha, B. R.; de Silva, S. L.; Singer, B. S.; Jimenez, N. C.; Ort, M. H. (21 December 2010). "40Ar/39Ar chronostratigraphy of Altiplano-Puna volcanic complex ignimbrites reveals the development of a major magmatic province". Geological Society of America Bulletin. 123 (5–6): 821–840. Bibcode:2011GSAB..123..821S. doi:10.1130/B30280.1. Archived from the original on 30 January 2016. Retrieved 29 November 2015. ^ Rejuvenation and Repeated Eruption of a 1.0 Ma Supervolcanic System at Mangakino Caldera, Taupo Volcanic Zone, New Zealand American Geophysical Union, Fall Meeting 2012, abstract #V31C-2797. Retrieved 10 September 2017. ^ BG, Mason (2004). "The size and frequency of the largest explosive eruptions on Earth". Bull Volcanol. 66 (8): 735–748. Bibcode:2004BVol...66..735M. doi:10.1007/s00445-004-0355-9. ^ a b Hogg, A (2011). "Revised calendar date for the Taupo eruption derived by 14C wiggle-matching using a New Zealand kauri 14C calibration data set". The Holocene. 22 (4): 439–449. Bibcode:2012Holoc..22..439H. doi:10.1177/0959683611425551. hdl:10289/5936. ^ Xu, JD (2013). "Climatic impact of the Millennium eruption of Changbaishan volcano in China: New insights from high-precision radiocarbon wiggle-match dating" (PDF). Geophysical Research Letters. 40 (1): 54–59. Bibcode:2013GeoRL..40...54X. doi:10.1029/2012GL054246. ^ Vidal, CM (2015). "Dynamics of the major plinian eruption of Samalas in 1257 A.D. (Lombok, Indonesia)". Bull Volcanol. 77 (9): 73. Bibcode:2015BVol...77...73V. doi:10.1007/s00445-015-0960-9. ^ "Santorini". Global Volcanism Program. Smithsonian Institution. Archived from the original on 4 August 2017. Retrieved 4 August 2017. ^ a b Smith; et al. (2013). "Identification and correlation of visible tephras in the Lake Suigetsu SG06 sedimentary archive, Japan: chronostratigraphic markers for synchronising of east Asian/west Pacific palaeoclimatic records across the last 150 ka". Quaternary Science Reviews. 67: 121–137. doi:10.1016/j.quascirev.2013.01.026. ^ Latter, J. H.; Lloyd, E. F.; Smith, I. E. M.; Nathan, S. 1992. Volcanic hazards in the Kermadec Islands and at submarine volcanoes between southern Tonga and New Zealand Archived 22 May 2010 at the Wayback Machine, Volcanic hazards information series 4. Wellington, New Zealand. Ministry of Civil Defence. 44 p.
^ "Macauley Island". Global Volcanism Program. Smithsonian Institution. ^ Lidstrom, John (June 1972). A New Model for the Formation of Crater Lake (PDF File) (Doctor of Philosophy thesis). Corvallis, Oregon, United States of America: Oregon State University. Archived (PDF) from the original on 30 July 2017. ^ "Kurile Lake on the Global Volcanism Program". volcano.si.edu. Archived from the original on 4 January 2017. Retrieved 3 January 2017. ^ Froggatt, P. C. & Lowe, D. J. (1990). "A review of late Quaternary silicic and some other tephra formations from New Zealand: their stratigraphy, nomenclature, distribution, volume, and age". New Zealand Journal of Geology and Geophysics. 33: 89–109. doi:10.1080/00288306.1990.10427576. Archived from the original on 22 April 2012. ^ I. A. Nairn; C. P. Wood; R. A. Bailey (December 1994). "The Reporoa Caldera, Taupo Volcanic Zone: source of the Kaingaroa Ignimbrites". Bulletin of Volcanology. 56 (6): 529–537. Bibcode:1994BVol...56..529N. doi:10.1007/BF00302833. ^ Karl D. Spinks, J.W. Cole, & G.S. Leonard 2004. Caldera Volcanism in the Taupo Volcanic Zone. In: Manville, V.R. | ed. Geological Society of New Zealand/New Zealand Geophysical Society/26th New Zealand Geothermal Workshop, 6–9 December 2004, Taupo: field trip guides. Geological Society of New Zealand miscellaneous publication 117B. ^ Bailey, R. A. & Carr, R. G. (1994). "Physical geology and eruptive history of the Matahina Ignimbrite, Taupo Volcanic Zone, North Island, New Zealand". New Zealand Journal of Geology and Geophysics. 37 (3): 319–344. doi:10.1080/00288306.1994.9514624. ^ Briggs, R.M. ; Gifford, M.G. ; Moyle, A.R. ; Taylor, S.R. ; Normaff, M.D. ; Houghton, B.F.; Wilson, C.J.N. (1993). "Geochemical zoning and eruptive mixing in ignimbrites from Mangakino volcano, Taupo Volcanic Zone, New Zealand". Journal of Volcanology and Geothermal Research. 56 (3): 175–203. Bibcode:1993JVGR...56..175B. doi:10.1016/0377-0273(93)90016-K.
^ Dethier, David P.; Kampf, Stephanie K. (2007). Geology of the Jemez Region II. New Mexico Geological Society. p. 499 p. Archived from the original on 17 October 2015. Retrieved 6 November 2015. ^ Izett, Glen A. (1981). "Volcanic Ash Beds: Recorders of Upper Cenozoic Silicic Pyroclastic Volcanism in the Western United States". Journal of Geophysical Research. 86 (B11): 10200–10222. Bibcode:1981JGR....8610200I. doi:10.1029/JB086iB11p10200. ^ Shipley, Niccole; Bindeman, Ilya; Leonov, Vladimir (18–21 October 2009). "Petrologic and Isotopic Investigation of Rhyolites from Karymshina Caldera, the Largest "Super"caldera in Kamchatka, Russia". Portland GSA Annual Meeting. Archived from the original on 8 June 2011. ^ Leonov, V. L.; A. N. Rogozin (October 2007). "Karymshina, a giant supervolcano caldera in Kamchatka: Boundaries, structure, volume of pyroclastics". Journal of Volcanology and Seismology. 1 (5): 296–309. doi:10.1134/S0742046307050028. ^ Ashfall Fossil Beds State Historical Park. "The Ashfall Story". Archived from the original on 20 August 2006. Retrieved 8 August 2006. ^ Soler, M.M. ; Caffe, P.J; Coira, B.L. ; Onoe, A.T.; Kay, S. Mahlburg (July 2007). "Geology of the Vilama caldera: A new interpretation of a large-scale explosive event in the Central Andean plateau during the Upper Miocene". Journal of Volcanology and Geothermal Research. 164 (1–2): 27–53. Bibcode:2007JVGR..164...27S. doi:10.1016/j.jvolgeores.2007.04.002. ^ Ort, Michael H. (June 1993). "Eruptive processes and caldera formation in a nested downsagcollapse caldera: Cerro Panizos, central Andes Mountains". Journal of Volcanology and Geothermal Research. 56 (3): 221–252. Bibcode:1993JVGR...56..221O. doi:10.1016/0377-0273(93)90018-M.
^ Lambert, Maurice B. (1978). Volcanoes. North Vancouver, British Columbia: Energy, Mines and Resources Canada. ISBN 978-0-88894-227-2. ^ "Mystery of the Megavolcano" Archived 17 June 2017 at the Wayback Machine. Pbs.org. Accessed on 2017-10-12. Mason, Ben G.; Pyle, David M.; Oppenheimer, Clive (2004). "The size and frequency of the largest explosive eruptions on Earth". Bulletin of Volcanology. 66 (8): 735–748. Bibcode:2004BVol...66..735M. doi:10.1007/s00445-004-0355-9. Oppenheimer, C. (2011). Eruptions that shook the world. Cambridge University Press. ISBN 978-0-521-64112-8. Timmreck, C.; Graf, H.-F. (2006). "The initial dispersal and radiative forcing of a Northern Hemisphere mid-latitude super volcano: a model study". Atmospheric Chemistry and Physics. 6: 35–49. doi:10.5194/acp-6-35-2006. This page was last edited on 17 April 2019, at 19:26 (UTC).